http://hedweb.com – The Hedonistic Imperative outlines how genetic engineering and nanotechnology will abolish suffering in all sentient life. The abolitionist project is hugely ambitious but technically feasible. It is also instrumentally rational and morally urgent. The metabolic pathways of pain and malaise evolved because they served the fitness of our genes in the ancestral environment. They will be replaced by a different sort of neural architecture – a motivational system based on heritable gradients of bliss. States of sublime well-being are destined to become the genetically pre-programmed norm of mental health. It is predicted that the world’s last unpleasant experience will be a precisely dateable event. Two hundred years ago, powerful synthetic pain-killers and surgical anesthetics were unknown. The notion that physical pain could be banished from most people’s lives would have seemed absurd. Today most of us in the technically advanced nations take its routine absence for granted. The prospect that what we describe as psychological pain, too, could ever be banished is equally counter-intuitive. The feasibility of its abolition turns its deliberate retention into an issue of social policy and ethical choice. This is another TEDx talk (I’m on another TED kick, what can I say…) called Graphene science | Mikael Fogelström | TEDxGöteborg. I respect Mikael Fogelström for delivering this speech. Mikael was obviously struggling with stage fright, but he didn’t stop and what’s more important is that it was actually still a great presentation. Graphene. These just one-atom thick carbon structures is without doubt the most buzzed-about material in the world of science today. Kostya Novoselov and André Geim was awarded the 2010 Nobel Prize for their work on the matter and right now research teams all over the world are competing to turn knowledge into applications. The possibilities are endless. Mikael Fogelström, Professor at Chalmers, coordinates two large national research projects on graphene science. “We are still in the beginning”, he says. This is Wade Adams delivering a TEDx presentation called TEDxHouston 2011 – Wade Adams – Nanotechnology and Energy. I remember reading something at the MIT News website a few years ago about gold nanorods using gamma rays to destroy cancer cells (ok, just looked it up – I was close… kinda). Let me just say that nanotech is finally becoming a reality. Let’s just all agree not to make gray goo, yeah? Dr. Wade Adams is the Director of the Smalley Institute for Nanoscale Science and Technology at Rice University. The Institute is devoted to the development of new innovations on the nanometer scale. Some of the institute’s current thrusts include research in carbon nanotubes, medical applications of nanoparticles, nanoporous membranes, molecular computing, and nanoshell diagnostic and therapeutic applications. Wade was appointed a senior scientist (ST) in the Materials Directorate of the Wright Laboratory in 1995. Prior to that he was a research leader and in-house research scientist in the directorate. For the past 36 years he has conducted research in polymer physics, concentrating on structure-property relations in high-performance organic materials. He is internationally known for his research in high-performance rigid-rod polymer fibers, X-ray scattering studies of fibers and liquid crystalline films, polymer dispersed liquid crystals, and theoretical studies of ultimate polymer properties. This is one of the longer presentations I’ve seen by Ray Kurzweil. In the video, Kurzweil discusses some of the concepts behind his latest book, How to Create a Mind. This talk covers a lot of ground; everywhere from the Kurzweil’s Law (Law of Accelerating Returns), merging with technology, pattern recognizing technology, the effects of economy on life expectancy, solar energy, medical technology, education… Well, you get the picture. Check it out. This isn’t an article so much as it is a memo posted on the NASA website. Basically, the ‘article’ states that NASA supports the Singularity University endeavor. This is actually kind of old news (from 2009), but part of the mission of Dawn of Giants is to convince people of the need to take transhumanism and the idea of the technological singularity seriously. Maybe the support of government agencies like NASA and DARPA will help to this end. Rachel Prucey – Ames Research Center, Moffett Field, Calif.
Denise Vardakas – Singularity University, Moffett Field, Calif.
MOFFETT FIELD, Calif., — Technology experts and entrepreneurs with a passion for solving humanity’s grand challenges, will soon have a new place to exchange ideas and facilitate the use of rapidly developing technologies. NASA Ames Research Center today announced an Enhanced Use Lease Agreement with Singularity University (SU) to house a new academic program at Ames’ NASA Research Park. The university will open its doors this June and begin offering a nine-week graduate studies program, as well as three-day chief executive officer-level and 10-day management-level programs. The SU curriculum provides a broad, interdisciplinary exposure to ten fields of study: future studies and forecasting; networks and computing systems; biotechnology and bioinformatics; nanotechnology; medicine, neuroscience and human enhancement; artificial intelligence, robotics, and cognitive computing; energy and ecological systems; space and physical sciences; policy, law and ethics; and finance and entrepreneurship. Singularity University was founded Sept. 20, 2008 by a group of leaders, including Worden; Ray Kurzweil, author and futurist; Peter Diamandis, space entrepreneur and chairman of the X PRIZE Foundation; Robert Richards, co-founder of the International Space University; Michael Simpson, president of the International Space University; and a group of SU associate founders who have contributed time and capital. “With its strong focus on interdisciplinary learning, Singularity University is poised to foster the leaders who will create a uniquely creative and productive future world,” said Kurzweil. NASA Ames Center Director S. Pete Worden hosted SU’s Founders Conference on Sept. 20, 2008 at NASA Ames. On NASA’s behalf he and other Ames personnel provided input to SU’s founders and encouraged the scientific and technical discussions. Neither Dr. Worden nor any other NASA employee is otherwise engaged in the University’s operation nor do any NASA Ames employees have personal or financial interests in Singularity University. As with other educational institutions, NASA employees may support educational activities of SU through lectures, discussions and interactions with students and staff. NASA employees may also attend SU as students. Chris Raymond at success.com interview Ray Kurzweil. The article is called Ray Kurzweil: The Exponential Mind. It follows the usual Kurzwelian interview parameters (a little background, explain exponential growth with examples, discuss where technology is taking us), but it also goes into some of the things his critics have to say and talks a bit about Kurzweil’s new role at Google. The inventor, scientist, author, futurist and director of engineering at Google aims to help mankind devise a better world by keeping tabs on technology, consumer behavior and more. Ray Kurzweil is not big on small talk. At 3:30 on a glorious early summer afternoon, the kind that inspires idle daydreams, he strides into a glass-walled, fifth-floor conference room overlooking the leafy tech town of Waltham, Mass. It doesn’t quite qualify as rude. He’s got a plane to catch this evening, and he’s running nearly two hours behind schedule. But there is a hint of menace to the curtness, a subtle warning to keep things moving. And this is certainly in keeping with Kurzweil’s M.O. It would appear the 66-year-old maverick has operated this way since birth. He decided to become an inventor at age 5, combing his Queens, N.Y., neighborhood for discarded radios and bicycle parts to assemble his prototypes. In 1965, at age 17, he unveiled an early project, a computer capable of composing music, on the Steve Allen TV show I’ve Got a Secret. He made his first trip to the White House that same year, meeting with Lyndon Johnson, along with other young scientists uncovered in a Westinghouse talent search. As a sophomore at MIT, he launched a company that used a computer to help high school students find their ideal college. Then at 20, he sold the firm to a New York publisher for $100,000, plus royalties. The man has been hustling since he learned how to tie his shoes. Though he bears a slight resemblance to Woody Allen—beige slacks, open collar, reddish hair, glasses—he speaks with the baritone authority of Henry Kissinger. He brings an engineer’s sense of discipline to each new endeavor, pinpointing the problem, surveying the options, choosing the best course of action. “He’s very good at triage, very good at compartmentalizing,” says Ptolemy. A bit ironically, Kurzweil describes his first great contribution to society—the technology that first gave computers an audible voice—as a solution he developed in the early 1970s for no problem in particular. After devising a program that allowed the machines to recognize letters in any font, he pursued market research to decide how his advancement could be useful. It wasn’t until he sat next to a blind man on an airplane that he realized his technology could shatter the inherent limitations of Braille; only a tiny sliver of books had been printed in Braille, and no topical sources—newspapers, magazines or office memos—were available in that format. The passion for helping humanity has pushed Kurzweil to establish double-digit companies over the years, pursuing all sorts of technological advancements. Along the way, his sleepy eyes have become astute at seeing into the future. In The Age of Intelligent Machines, first published in 1990, Kurzweil started sharing his visions with the public. At the time they sounded a lot like science fiction, but a startling number of his predictions came true. He correctly predicted that by 1998 a computer would win the world chess championship, that new modes of communication would bring about the downfall of the Soviet Union, and that millions of people worldwide would plug into a web of knowledge. Today, he is the author of five best-selling books, including The Singularity Is Near and How to Create a Mind. This wasn’t his original aim. In 1981, when he started collecting data on how rapidly computer technology was evolving, it was for purely practical reasons. “Invariably people create technologies and business plans as if the world is never going to change,” Kurzweil says. As a result, their companies routinely fail, even though they successfully build the products they promise to produce. Visionaries see the potential, but they don’t plot it out correctly. “The inventors whose names you recognize were in the right place with the right idea at the right time,” he explains, pointing to his friend Larry Page, who launched Google with Sergey Brin in 1998, right about the time the founders of legendary busts Pets.com and Kozmo.com discovered mankind wasn’t remotely ready for Internet commerce. How do you master timing? You look ahead. Kurzweil subscribes to this notion. He has boundless confidence in man’s ability to construct a better world. This isn’t some utopian dream. He has the data to back it up—and a team of 10 researchers who help him construct his mathematical models. They’ve been plotting the price and computing power of information technologies—processing speed, data storage, that sort of thing—for decades. In his view, we are on the verge of a great leap forward, an age of unprecedented invention, the kinds of breakthroughs that can lead to peace and prosperity and make humans immortal. In other words, he has barely begun to bend time to his will. Our minds are trained to see the world linearly. If you drive at this speed, you will reach your destination at this time. But technology evolves exponentially. Kurzweil calls this the Law of Accelerating Returns. He leans back in his chair to retrieve his cellphone and holds it aloft between two fingers. “This is several billion times more powerful than the computer I used as an undergraduate,” he says, and goes on to point out that the device is also about 100,000 times smaller. Whereas computers once took up entire floors at university research halls, far more advanced models now fit in our pockets (and smaller spaces) and are becoming more miniscule all the time. This is a classic example of exponential change. The Human Genome Project is another. Launched in 1990, it was billed from the start as an ambitious, 15-year venture. Estimated cost: $3 billion. When researchers neared the time line’s halfway point with only 3 percent of the DNA sequencing finished, critics were quick to pounce. What they did not see was the annual doubling in output. Thanks to increases in computing power and efficiency, 3 percent became 6 percent and then 12 percent and so on. With a few more doublings, the project was completed a full two years ahead of schedule. That is the power of exponential change. The fruits of these accelerating returns are all around us. It took more than 15 years to sequence HIV beginning in the 1980s. Thirty-one days to sequence SARS in 2003. And today we can map a virus in a single day. While thinking about the not-too-distant future, when virtual reality and self-driving cars, 3-D printing and Google Glass are norms, Kurzweil dreams of the next steps. In his vision, we’re rapidly approaching the point where human power becomes infinite. Holding the phone upright, he swipes a finger across the glass. Imagine having Wikipedia linked directly to your brain cells. Imagine digital neurons that reverse the effects of Parkinson’s disease.Maybe we can live forever. He smiles, letting the sweep of his statements sink in. Without question, it is an impressive bit of theater. He loves telling stories, loves dazzling people with his visions. But his zeal for showmanship has been known to backfire. The biologist P.Z. Myers has called him “one of the greatest hucksters of the age.” Other critics have labeled him crazy and called his ideas hot air. Kurzweil’s public pursuit of immortality doesn’t help matters. In an effort to prolong his life, Kurzweil takes 150 supplements a day, washing them down with cup after cup of green tea and alkaline water. He monitors the effects of these chemistry experiments with weekly blood tests. It’s one of a few eccentricities. But it’s hard to argue with the results. Kurzweil claims 86 percent of his predictions for the year 2009 came true. Others insist the figure is actually much lower. But that’s just part of the game. Predicting is hard work. Despite what his critics say, Kurzweil is not blind to the threats posed by modern science. If nanotechnology could bring healing agents into our bodies, nano-hackers or nano-terrorists could spread viruses—the literal, deadly kind. “Technology has been a double-edged sword ever since fire,” he says. “It kept us warm, cooked our food, but also burned down our villages.” That doesn’t mean you keep it under lock and key. In January of 2013, Kurzweil entered the next chapter of his life, dividing his time between Waltham and San Francisco, where he works with Google engineers to deepen computers’ understanding of human language. “It’s my first job with a company I didn’t start myself,” he deadpans. The idea is to move the company beyond keyword search, to teach computers how to grasp the meaning and ideas in the billions of documents at their disposal, to move them one more step forward on the journey to becoming sentient virtual assistants—picture Joaquin Phoenix’s sweet-talking laptop in 2013’s Kurzweil-influenced movie Her, a Best Picture nominee. That’s not to say Page will sit idle while Kurzweil toils away. In the last year, the Google CEO has snapped up eight robotics companies, including industry frontrunner Boston Dynamics. He paid $3.2 billion for Nest Labs, maker of learning thermostats and smoke alarms. He scooped up the artificial intelligence startup DeepMind and lured Geoffrey Hinton, the world’s foremost expert on neural networks—computer systems that function like a brain—into the Google fold. Kurzweil’s ties to Page run deep. Google (and NASA) provided early funding for Singularity University, the education hub/startup accelerator Kurzweil launched with the XPRIZE’s Peter Diamandis to train young leaders to use cutting-edge technology to make life better for billions of people on Earth. Kurzweil’s faith in entrepreneurship is so strong that he believes it should be taught in elementary school. Because that kid with the cellphone now has a chance to change the world. If that seems far-fetched, consider the college sophomore who started Facebook because he wanted to meet girls or the 15-year-old who recently invented a simple new test for pancreatic cancer. This is one source of his optimism. Another? The most remarkable thing about the mathematical models Kurzweil has assembled, the breathtaking arcs that demonstrate his thinking, is that they don’t halt their climb for any reason—not for world wars, not for the Great Depression. Once again, that’s the power of exponential growth. “Things that seemed impossible at one point are now possible,” Kurzweil says. “That’s the fundamental difference between me and my critics.” Despite the thousands of years of evolution hard-wired into his brain, he resists the urge to see the world in linear fashion. That’s why he’s bullish on solar power, artificial intelligence, nanobots and 3-D printing. That’s why he believes the 2020s will be studded with one huge medical breakthrough after another. He looks down at his watch yet again. Mickey Mouse peeks out from behind the timepiece’s sweeping hands. “Just a bit of whimsy,” he says. Nearly an hour has passed. The world has changed. It’s time to get on with his day. This is an article from the MIT Technology Review website called How Smart Dust Could Spy On Your Brain which is based on research being conducted at the University of California Berkeley. The future applications of this technology will be to allow higher resolution brain scans and shows potential as a medium for brain-machine interfaces (BMI). It will be interesting to see where this research goes. The real time monitoring of brain function has advanced in leaps and bounds in recent years. That’s largely thanks to various new technologies that can monitor the collective behaviour of groups of neurons, such as functional magnetic resonance imaging, magnetoencephalopathy and positron emission tomography. This work is revolutionising our understanding of the way the brain is structured and behaves. It has also lead to a new engineering discipline of brain-machine interfaces, which allows people to control machines by thought alone. Impressive though these techniques are, they all suffer from inherent limitations such as limited spatial resolution, a lack of portability and extreme invasiveness. Today, Dongjin Seo and pals at the University of California Berkeley reveal an entirely new way to study and interact with the brain. Their idea is to sprinkle electronic sensors the size of dust particles into the cortex and to interrogate them remotely using ultrasound. The ultrasound also powers this so-called neural dust. Each particle of neural dust consists of standard CMOS circuits and sensors that measure the electrical activity in neurons nearby. This is coupled to a piezoelectric material that converts ultra-high-frequency sound waves into electrical signals and vice versa. The neural dust is interrogated by another component placed beneath the scale but powered from outside the body. This generates the ultrasound that powers the neural dust and sensors that listen out for their response, rather like an RFID system. The system is also tetherless–the data is collected and stored outside the body for later analysis. That gets around many of the limitations. The system is lower power, can have a high spatial resolution, and it is easily portable. It is also rugged and can potentially provides a link over long periods of time. “A major hurdle in brain-machine interfaces (BMI) is the lack of an implantable neural interface system that remains viable for a lifetime,” say Seo and co. The difficulty is in designing and building such a system and today’s paper is a theoretical study of these challenges. First is the problem of designing and building neural dust particles on a scale of roughly 100 micrometres that can send and receive signals in the harsh, warm and noisy environment within the body. That’s why Seo and co have chosen ultrasound to send and receive data. They calculate that the power required to use electromagnetic waves on the scale would generate a damaging amount of heat because of the amount of energy the body absorbs and the troubling signal-to-noise ratios at this scale. By contrast, ultrasound is a much more efficient and should allow the transmission of at least 10 million times more power than electromagnetic waves at the same scale. Next is the problem of linking the electronics to the piezoelectric system that converts ultrasound to electronic signals and vice versa. 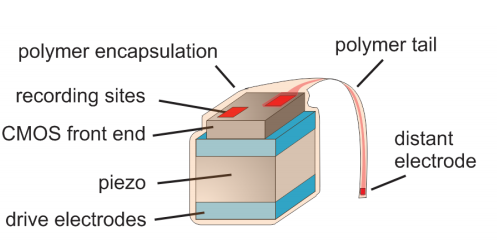 Ensuring that the system works efficiently will be tricky given that it has to be packaged in an inert polymer or insulator film (which must also expose the recording electrodes to nearby neurons). Finally, there is the challenge of designing and building the interrogation system that generates the ultrasound to power the entire array but at a low enough power to avoid heating skull and the brain. On top of all this is the additional challenge of implanting the neural dust particles in the cortex. Seo and co say this can probably be done by fabricating the dust particles on the tips of a fine wire array, held in place by surface tension, for example. This array would be dipped into the cortex where the dust particles become embedded. That’s an ambitious vision that is littered with challenges beyond the state-of-the-art. However, the team has a strong background in nanoelectromechanical systems and in the interface between electronic systems and cells. Indeed, one of the authors, Michel Maharbiz, developed the world’s first remotely controlled beetle a few years ago, a development that was named one of the top 10 emerging technologies of 2009 by Technology Review. These guys are clearly not afraid to take on big challenges. It’ll be interesting to see how they fare.